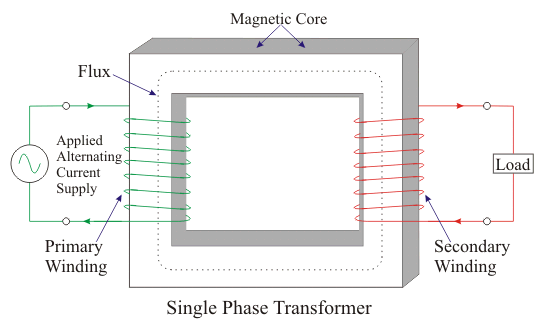 The transformer is a static device which converts the magnetic energy into electrical energy. It consists of two or more than two stationary circuits interlinked by a common magnetic circuit; the energy transfer takes place through this circuit without having any change in frequency from one circuit to another. The transformer consists of two windings. The winding which is connected with the supply a.c. voltage is called the primary winding, and the winding which is connected to load and delivers the energy to load is called secondary winding. 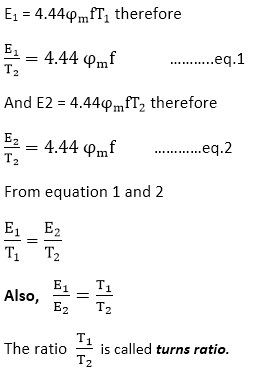 Where Em = Tωφm =maximum value of e.
This is called as e.m.f. equation of transformer. The ratio E/T is called voltage per turn. Step - up transformer: These are the transformer in which the output voltage is higher than the input voltage. Step - down transformer: These are the transformer in which the output voltage is less than the input voltage. NOTE: The same transformer can be used as a step up transformer and step down transformer by changing the way it is connected. If we want the transformer to work as a step up transformer, then low voltage winding is the primary, and if we want it to work as a step-down transformer, then high voltage winding is the primary.